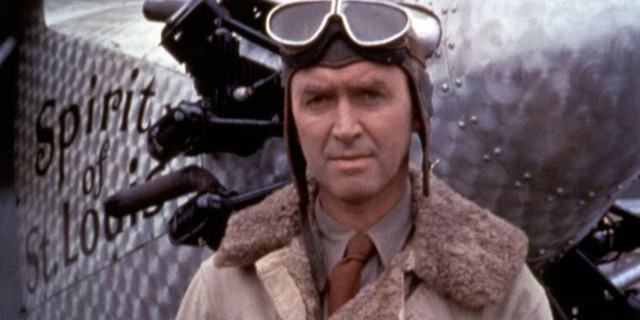 The true story of Charles Lindbergh’s historical solo transatlantic flight from New York to Paris in 1927 brought to the big screen in a Cinemascope production, directed by Billy Wilder and starring James Stewart as the famed pilot. Warner Brothers bought the film rights to Lindbergh’s 1953 autobiography and were eager to bring it to movie audiences. A historic journey of a man who paved the way for the future of aviation and who would become one of the most popular and revered heroes of the twentieth century. It looked like a surefire hit for the studio. Unfortunately for Warners, the films budget ballooned and the production stretched on for nearly a year. It was reported Warners polled sneak preview audiences and discovered most people under forty were not unaware of who Lindbergh was or what his accomplishments meant to the world and history. I guess, even in 1957 the majority of young people weren’t too interested in things that occurred before they showed up on the planet. Lindbergh’s later controversial actions might have also helped cooled audiences of wanting to see an adulating bio-pic of the man as well. 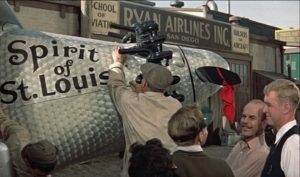 The Spirit of St. Louis would end up costing Warners six million dollars, it would not be the popular hit they had hoped for and according to some sources it would become “one of the studios biggest financial failures in its history”. Lindy wasn’t completely lucky apparently – at least when it came to a movie about him. The film itself never reaches the heights of greatness that the story deserves to have. It’s not a terrible film at all. In fact I always thought it has some really good scenes sprinkled throughout it. The problem is that they’re just sprinkled and they become interspersed with some very hackneyed, uninspired ones. When the film stays focused on Lindbergh’s flight – the preparation of it, the buildup, the actual flight itself – it’s good. It amps up some tension, and along with Stewart’s effective performance is when the movie works. Yes, Stewart was too old to play the part. The film might have been better served with a younger actor playing Lindbergh. Setting aside his wrinkles and dyed blonde hair, Stewart does play the optimistic, determination of Lindbergh that was needed for the story quite well. He’s good in the extended flight portions where it’s him alone holding the screen. You want to root for him. So, with his casting the film benefits from Stewart’s persona of being the ‘aw shucks, unwavering dogged, likable hero – it’s just that it comes in a package twice the age it should be for the role. It’s when they try to create the portrait of the man himself and go into his background via flashbacks when things falter. 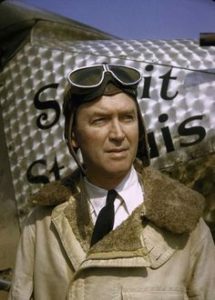 During the thirty-plus hour flight the film takes breaks from Stewart in the cockpit and recounts some of the incidents of him being a young man. And they don’t work very well. Many of the flashbacks feel inconsequential appearing during the present day story. They aren’t very interesting and they interrupt the drama unfolding with Lindbergh and the problems he has to overcome during his transatlantic flight. Sleep deprivation, icing, navigational problems, all with Stewart’s voiceover are much more interesting than any of the flashbacks we see. Even the odd device of him talking with a fly in the cockpit kind of works. 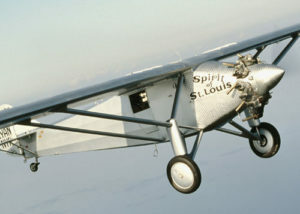 The best portions of the movie is watching the construction of the Spirit, learning about some of the specialized details that went into it and Stewart’s one man show flying it over the Atlantic. In fact, there really aren’t any notable supporting characters in the entire film! It’s quite odd, considering the film runs for well over two hours. Arthur Space plays engineer Donald Hall and he’s the biggest presence other than Stewart, and he’s barely given enough time to make an impression. Another strange thing is Billy Wilder directing this. Going in one might have higher expectations knowing he’s at the helm. But there’s noting particularly unique or special about it, including the dialogue – which Wilder could be brilliant at. It’s a very workmanlike movie and never excels above being a typical bio pic. I always have to remind myself that this is indeed a Wilder film. It’s a very unremarkable movie. There are enough scenes that I always feel makes it worthwhile to see, but The Spirit of St. Louis settles into a safe, standard film. The flashbacks to Lindbergh’s younger adventures really drag the film out. I would have liked to have seen them all nixed and that time spent on after the successful flight, which is never shown. The Spirit lands, crowds rush to Stewart and it ends with actual film footage of the real ticker tape parade for Lindbergh. It would have been nice to have seen the impact of Lindbergh’s accomplishment dramatized, his own reaction to it and the realization he had just become one of the most famous men in the world. It’s not a ‘Must See’ movie, but if you do watch it you’ll get a few rewarding scenes, but not enough to make you want to revisit it. I personally liked this movie. But I do get where you are coming from. The scene that sums up this movie is the bank scene were Lindbergh makes his pitch. To make the character feel more ‘man of the people’ they have Stewart act like a awkward goof. I’m sure to add some levity to the story. But when the businessmen start asking direct questions about the challenges for flying over the Atlantic, the scene suddenly becomes serious and much more interesting. The businessmen challange Linbergh with their ideas, he comes back with a good answer. Showing that he actually thought this out. The whole movie is like that. When it trys to be funny, it doesn’t work. When they stay on subject, it can be quite fascinating. For me, the aerial circus didn’t work and should have been left on the cutting room floor. The best scene was the landing scene were Jimmy plays a guy at the end of his rope and may trip at the finish line. Its sad this was a blight on Jimmy’s career. But I did research Charles LIndbergh because of this movie and I thnk the guy was interesting. He had his flaws to be sure. But he was not boring. A good try. That’s my feelings on it. One little moment I liked was when Stewart was explaining how far he’d have to travel off the U.S. map in that little cabin bar. He uses his hand to show the miles he’ll travel which leaves the map and ends at a knothole on the wall. Later when they’re listening to his take off they have a picture of the Eiffel Tower where that knot hole is. I think you’re right the humor doesn’t always work – like his plane falling apart when he lands at the army base. But they do manage to create some nice tension in parts of his flight. I’d be curious to see a movie about Lindbergh after his fame hit and all the controversy that surrounded him. There was an HBO movie about the kidnapping – Crime of the Century, which was really good. But I’ve never heard of another flick focusing on Lindbergh himself. Because of this movie, I read a lot about Lindbergh. The irony of his life was that because he got the first Atlantic flight so right he thought he could extend that intelligence into other areas. The problem was he was wrong most of the time. Spectacularly, in some cases. A reminder that it’s good to be humble. I asked my dad why Lindbergh was flying over Canada to get to Paris. We got out the family globe. He handed me a string and told me to connect New York and Paris. And I saw why immediately. I learned about the curvature of the earth that day.